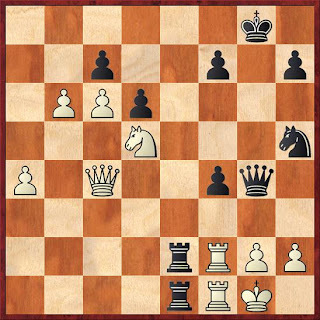 Figjam Chess: European Teams 2011 R7-9: Germany win! European Teams 2011 R7-9: Germany win! On Boards 2 and 3, Gashimov and Mamedyarov scored nice wins - you can see those games here and here. A position with appealing geometry all over. Sensation as the German team defeat the Azeris 2½-1½ to overtake them in the lead (Naiditsch scoring the crucial win against Radjabov on top board), with Armenia also keeping pace by defeating the Dutch 3-1. The Romanian team surprised yet again by holding Hungary to a draw, and Bulgaria were back to their winning ways, beating Italy 3-1. Radjabov as White began with 1.Nf3 d5 2.c4 d4 3.b4, a line I am fond of playing also, although objectively, with Black playing the best lines I don't think White can hope for much of an advantage. I held a faint hope that he had found some new lines to disprove this, but it wasn't to be as Naiditsch comfortably gained the upper hand. Table 4 - Russia beat Slovenia 3-1, but the losses in Rounds 4 and 6 were too costly, so they did not have enough to reach the podium. As Ian Rogers commented on today's The Canberra Times chess column, a team of champions isn't necessarily a champion team - after the failures at gold over the years, it must be difficult to change the flow of things, but they will have to try and meet the expectations as the top seeded team again at next year's Olympiad in Turkey. Table 3 - A demolition of Bulgaria by Hungary - 4-0!? Leko's win over Topalov was quite exciting, and his teammates also played strongly to win - but such a scoreline between two battle-hardened teams is difficult to explain with just the play. While Hungary had been bubbling a couple of MP's below the leaders for several rounds, eyeing chances of bronze, the Bulgarians had been leading the event at one stage, and perhaps they found it hard to play with both intensity and objectivity when their chances of gold were now very, very slim. Table 2 - Gashimov and Mamedyarov won again, and the Azeris were victorious against the Romanians 3-1. So, at this point, the Azeris were on 14MP (23GP), and following on 13MP were Hungary (23) and Russia (21½). As the leaders on 13MP had 21 and 20 GP, Azerbaijan could potentially take gold! And thanks to their 4-0 win, the Hungarians now were real candidates for bronze. Table 1 - Naiditsch and Aronian had a quick draw on Board 1, and Fridman-Akopian on Board 3 was also drawn. 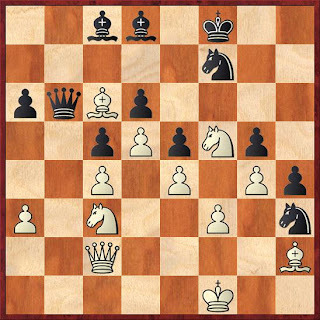 Germany's 2nd board Meier played a brilliant French game beating Movsesian, so everyone's eyes were on the Board 4 game which lasted over 5 hours - could German Board 4 Gustafsson hold on for a draw to give the team gold, or would Sargissian win to tie the match 2-2, giving Azerbaijan gold? Armenia (22½) and Russia (21½) missed out on tiebreaks. No-one saw the 10th seeds as victors before the event - their first team gold since the Buenos Aires Olympiad in 1939! As has been mentioned in several places, the German team's success was a genuine team effort. Their only two losses were in Round 5 to Bulgaria, and from there - a 3-1 win, followed by tight 2½-1½ wins in the final three rounds - with a different member scoring the much needed point each time. The final standings on chess-results.com is here. The Womens' event was won convincingly by top seeded team Russia (17MP, 25½GP), with Poland taking silver (14MP, 23GP) and Georgia bronze (14MP, 22½GP). Final round reports with lots of pictures and games on some major chess news sites are below, which are highly recommended viewing.